We’d love your help. Let us know what’s wrong with this preview of Tide Running by Oonya Kempadoo. To ask other readers questions about Tide Running, please sign up. It took a while for this book to sort of get to the point. The first few chapters is just descriptions, and so I put it down. Once I picked it up again, I enjoyed seeing how the story progressed - but after about the middle, it didn't seem like the story was going anywhere. And that's where I think this book fails. It's also difficult to read if you don't understand the dialect. Probably the best and most accurate book I've ever read that's set in the Caribbean. Having lived in the region for almost twenty years, I found it both charming and alarming but most of all, beautiful and honest. Love it. Took a long time to get to the story. Then didn't really go anywhere. It was more about descriptions than story. Reading the world in books: Guyana. I enjoyed the book, there was no point to it, it's rambling and written from a Jamaican dialect but I think it adds to the charm. I've never read anything like it before. I found this hard going with its mix of regular English and the local Tobagonian idiom. Not sure I really enjoyed it as it didn't seem to really be going anywhere. I'd certainly not be in a hurry to pick another by the same author but if given a copy I'm sure I'd work through it. In some ways, I really enjoyed this book--particularly the evocative setting. But the dialect and prose interfered with my understanding of the plot and characters, and that was frustrating. I probably read it too fast. I don't know exactly how I feel about this story. I felt a very strong pull to keep reading because I thought there would be something else to connect me with the many characters there was a sense of disconnection through to the end. Oonya Kempadoo is a writer who was born in Sussex, England in 1966 of Guyanese parents. She was brought up in Guyana and has since lived in Europe and various islands in the Caribbean. Her first novel, Buxton Spice, was published to great acclaim in 1998, and was nominated for the 2000 International IMPAC Dublin Literary Award. Her second book, Tide Running (Picador, 2001), set in Plymouth, Tobago, Oonya Kempadoo is a writer who was born in Sussex, England in 1966 of Guyanese parents. She was brought up in Guyana and has since lived in Europe and various islands in the Caribbean. Her first novel, Buxton Spice, was published to great acclaim in 1998, and was nominated for the 2000 International IMPAC Dublin Literary Award. 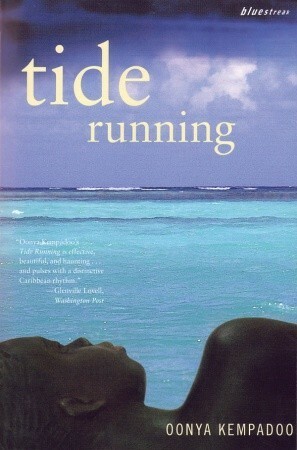 Her second book, Tide Running (Picador, 2001), set in Plymouth, Tobago, is the story of young brothers Cliff and Ossie. Oonya Kempadoo has studied art in Amsterdam and has lived in Trinidad, St. Lucia, Tobago, and now lives in Grenada. She was named a Great Talent for the Twenty-First Century by the Orange Prize judges and is a winner of the Casa de las Americas Prize.